Michael’s Valley Plumbing is also located in the same neighborhood as McCarthy Automotive. When they were approached by McCarthy to take advantage of their comprehensive Fleet Maintenance Program it made sense for Michael’s Valley Plumbing’s fleet – and owner Michael Mize liked the idea of supporting a fellow small business. Michael’s Valley Plumbing has 18 vehicles comprised of Ford and Chevrolet pick-up trucks, vans and box trucks. Michael Mize says, “They are very good about getting trucks in and out.” McCarthy Automotive conducts monthly maintenance aiding to extend the life of the fleet, assure safer vehicles and keep trucks truckin’, so Michael’s Valley Plumbing can serve its customers. 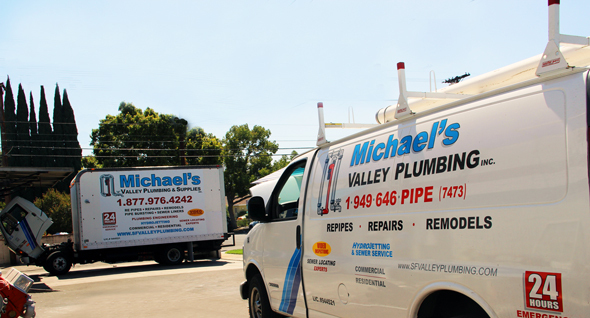 McCarthy Automotive stays in constant contact with Michael’s Valley Plumbing. Should a vehicle breakdown, McCarthy dispatches a tow truck to retrieve the vehicle and get it repaired quickly – it’s all part of McCarthy Automotive Fleet Maintenance membership privileges.